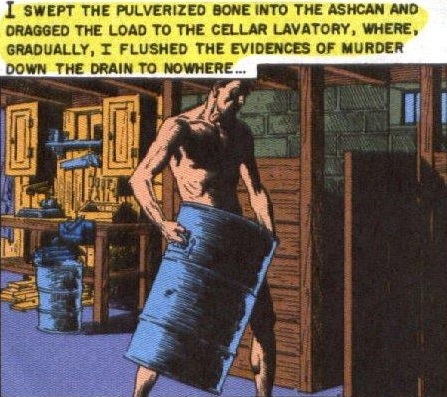 David Volney, a traveling hosiery salesman, murders Edwin Jordon and then dismembers and cremates his body. Jordon is the spitting image of Volney, with a gorgeous wife and a hefty bank account, so Volney took advantage of the resemblance and assumed the man's identity. He had come into town and been mistaken for Jordon at every turn; when he met Jordon's beautiful wife and beat up her boyfriend, the doll melted at his feet. There's only one problem: Jordon had murdered his wife's boyfriend not long before Volney killed Jordon, so when the police knock at the door he has to go along meekly to the pokey, since his alibi would also land him in the electric chair. Thank goodness for that big drum! 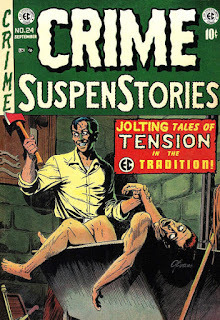 Reed Crandall's violent, shocking cover is more graphic than the corresponding scene in "Double-Crossed," but the first few pages of the story depict murder, dismemberment, and cremation in a fashion that is disgusting. The main character vomits and is so repelled by his own acts that he has to wait to clean up his own mess. The art in this story is superb but Wessler's tale seems to embrace gore for the sake of gore, and the character of the wife is ridiculous: she had been through with her husband until she saw him punch her boyfriend. That demonstration of masculinity was enough to change her mind in an instant. On a cold winter's night in Quebec, Bart Ryan is snuggled up with Rita when her husband Lloyd comes home unexpectedly early. Lloyd is beating Bart to a pulp when Rita hands her lover a gun and Bart shoots Lloyd through the noggin. He then takes the body out on a frozen river, chops a hole in the ice, and sinks the corpse in the cold water below. But that grinning, dead face begins to haunt Bart, who marries Rita but has to drink heavily to deal with his nightmares. A psychiatrist isn't much help, so Bart and Rita head off on an ocean voyage, hoping that this will finally give Bart's troubled mind a rest. Too bad the ship hits an iceberg and the last thing the couple sees before they drown is Lloyd's grinning face, looking at them out of the ice. There are enough twists and turns in "Crushed Ice" for about three stories, but Carl Wessler is so awkward about how he fits them together that the seams show and the plot seems clunky. Add Jack Kamen's standard, uninspired visuals to the mix and you have an average story--nothing more. Kamen's attempt to draw a shambling corpse in Bart's dreams looks about like you'd expect. 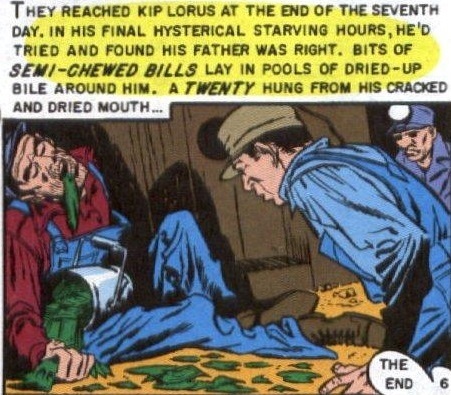 Sick and tired of working every day in the mines for peanuts, Kip Lorus murders the paymaster and steals the payroll, hiding the cash in his lunchbox. Kip goes to work that day as if nothing happened and stews about his hard-working father, who always yells at him for being greedy, telling him that he can't eat money. When news of the murder gets out, Kip panics and pretends to smell a gas leak. All the other miners escape, leaving Kip alone in the mine; a cave-in traps him and all he has is his lunchbox to keep him alive until he can be rescued. When found, he is dead with a mouthful of greenbacks. Who says money isn't good for you? Carl Wessler must have been getting paid by the word or by the plot twist, because the three stories so far in this issue have had too many of both. Joe Orlando's art can veer back and forth from impressive to almost ugly, sometimes in the same story, but once Kip's old man told him "you can't eat money," then I knew where "Food for Thought" was going and I was impatient to get there. A good story by Feldstein or Kurtzman never telegraphed the ending so clearly. The old saying that it's "More Blessed to Give . . ." than to receive is tested by Molly and Stanley Talbot, whose marriage became loveless some time ago. They buy each other deadly anniversary gifts: she will give him rat poison in a bottle of whiskey and he will give her a cake with a bomb in it. Their careful plans are upset when each sees the other preparing the deadly present, but in a surprise ending both get their wish. Peter: George Evans delivers two knockout covers this month. I really enjoyed "Double-Crossed," mostly for its dazzling Reed Crandall work, but this kind of story always makes me think how easy it was in the 1950s for someone to pass themselves off as someone else, even to a wife! I mean, the guy's not even a twin brother; he's just a dead ringer. Volney's got the same voice and mannerisms as Edwin Jordon without even having met him? Yeah, I know, without the extreme coincidences . . . no story. 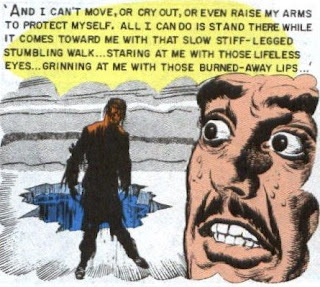 "Crushed Ice" is pretty doggone silly (no explanation is given as to how Lloyd's corpse got so far out to sea) but the sight of Lloyd's head lying in the fireplace is not something you see every day in a Jack Kamen strip. "Food for Thought" offers further proof that Joe Orlando's art was getting worse rather than better (odd since his 1960s-'70s stuff for DC was very effective). Here, at least, it's easier to stomach since there are no females and the main characters are grungy miners. The script is not bad, with the cave-in adding a nice, ironic touch. Rounding out the quartet this issue is the best story in Crime SuspenStories since the Feldstein/Ingels creepfest, "Jury Duty," way back in #6 (and this is the best overall CS issue in many a moon). "More Blessed To Give . . ." once again shows us the direction EC was heading thanks to B. Krigstein and his incredible style. But I don't want to sell Jack Oleck short; seems like all I do is bad-mouth Wessler and Oleck and here Jack seems to reach deep down into his magic writer's bag (way deeper than he's ever reached before, I hasten to add) to conjure up something special for Krigstein to visualize. "More Blessed . . ." is like a wonderful Rock Hudson/Doris Day screwball comedy gone wrong. Savor this one. Even though he’s technically 45 years old, “Smiddy” is still sporting freckles and working as an errand-boy for his eccentric, cotton ball-haired boss Mr. Bully and *still* doesn’t know what in the Sam Hill his supervisor does for a living. Other characters are stuck in the same time-warped loop of rehashed plots that Smiddy is, including his little baby brother Hoiby, the one with the lisp and the 5 o’clock shadow, and the rest of his no-good furshlugginer family. Mr. Bully for his part is intent on bagging Old Paunchdrunk, the infamous fighting fish of the Canadian waters that has eluded his grasp for the entirety of the comic strip’s history. Taking his usual trip up to the snowy wilds and aided by colorful supporting characters like “not smiling, Jack” and Real George, the zoot suit-wearing Native American guide, Mr. Bully finally witnesses the end of Old Paunchdrunk, but only after Hoiby disrobes from his Indian war chief disguise, claims the fish for his own, and heads off to sell it for its oil, fish oil being the industry that Smiddy finally learns his boss makes his money in. Even if you don’t know what in the Sam Hill is being parodied here, “Smiddy” is sure to still get you to bust up in the usual Will Elder-yuks. There’s the usual chicken fat as can be expected, but Feldstein and Elder throw in some nutty curveballs with the reprising cameos of Burt Lancaster and Deborah Kerr’s smooching characters from From Here to Eternity (always funny, whatever the context), Hoiby massacring an entire street corner with a tommy gun, and a recurring joke re: who should be working around here. For as delightful and colorful as “Smiddy” is for the duration of its seven pages, it unfortunately sets a precedent that the remaining contents of the issue couldn’t really hope to live up to. In “Hindu,” John Wayne swaggers his girth across the Old West to make love to the neglected wimmen-folk and give their ankle-biters the Paw to play catch with that they never had. On his latest bender, Wayne rides his giant trusty border collie Melvin to the next homestead and immediately begins schmoozing the chicken lady that is the evil farmer’s wife and teaching some valuable lessons to his furshlugginer kid, like how to swim (in dirt). Wayne trades harsh words with the Lone Stranger, blows the evil farmer’s head off, and is only rescued from scalping by Indian warriors when chicken lady claims he’s her husband, thus allowing all three of them to live happily ever after. So much for that last chip from anger management. “Hindu” has some solid Wood art and a handful of snicker-worthy moments (like when Melvin takes a break running from the Indian warriors to reminisce on the missed opportunity he had to be on Lassie), but aside from that it really isn’t worth talking about all that much. After serving you slop for breakfast, bidding you adieu, and strategically littering cleaning supplies around the house to make it appear as if she’s been busy all day, your wife settles in for a morning/afternoon marathon of her favorite radio soap opera, “When a Young Widow-Girl Marries Her Guiding Light Because She’s Got a Right to Happiness, the Road of Life Can Be Beautiful Backstage.” When she isn’t being charmed by the dulcet, alluring tones of the suave commercial spokesman (really just a balding alcoholic battling through his latest hangover), she lies there in coiled anticipation of what today’s episode has in store. She sits through a veritable speech of all the previous proceedings and haywire storylines that have brought the drama up to this point, and when it finally does arrive it’s… about 45 seconds of material in between the recap and the commercials. But even that little taste of heaven is enough to make her resent her unglamorous life as a “happy” homemaker and by extension, of course, you. Jose about what's been holding up his reviews. Hang it all, I don’t know what the heck it is about these dang radio show parodies, but for some reason I can’t help but like them. As in the case of “Breakfast with the Furshlugginers,” I realize inherently that these stories aren’t particularly hilarious, and in certain contexts they hardly qualify as stories but rather more like just a list of “things.” Feldstein’s captions and speech bubbles groan in both to the point of breaking from the weight, but there’s a quality of his ribbing of this particular medium—perhaps it’s the acid in his voice—that just makes it compulsively readable to me. Still, I can’t in good conscience score “Just Plain Bull” any higher than two and a half stars. I sleep bad as it is. In “I Touched a Flying Saucer,” some dingus sells millions of books based on his experiences photographing various objects thinking they’re UFOs from outer space including a hub cap, a thumbnail, a yo-yo, an alarm clock, beer can tops, and an umbrella. When his put-upon wife finally breaks her last nerve trying to pull her hubby’s head out of the stars, she throws something out the window that is destined to become the secret to his literary success: a “flying” saucer from the kitchen cabinet. A solitary giggle in a cosmos of unfunny. 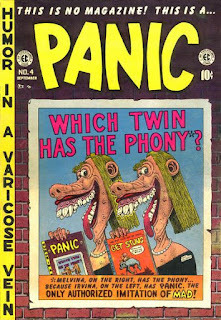 Peter: I've got some good news and I've got some bad news about this issue of Panic (and, actually, the good news has some semi-sorta-bad news attached). Whattaya want first? Okay, so the bad news is that three-quarters of this comic is about the furthest away from being a funny book as you'll ever find. "Hindu" is just another really bad film parody wherein Al considers changing the actor's name from Gene Autry to Gene Atrocity to be the very definition of a knee-slapper. "Just Plain Bull" would be considered by many in today's PC age to be sexist but I find it "Just Plain Stupid." And "I Touched a Flying Saucer!" means well but provides not one more laugh than the previous two stories. So, the good news? "Smiddy" is the funniest strip found so far in Panic. Yes, it would probably be considered weak for MAD, but here in the nation's most unfunny humor magazine, it shines like a diamond in a cowpie. The sight gags work (Kerr and Lancaster are still getting good mileage), the dialogue is very funny, and the satire is on the money. It's official: Will/Bill Elder is a genius. And that's the semi-sorta bad news; this company is not cultivating new talent, relying on Elder to provide the biggest guffaws for two titles now. Well, I've told you what I think. Let the other two schmoes dig deeper. "Somebody's gotta work! Who should it be? Me?!" Mark has murdered his brother Frank's lovely girl, Alice, and stood trial for it but now the judge has released the unrepentant murderer. Why? For that we'll have to go back into the past and discover the dark secrets behind the two (very close) brothers. All his life, Mark has been a rotten apple; his father knew it, Frank knew it, the whole world knew it. When their father takes his own life, the (inseparable) brothers are constantly at odds. Frank wants to do good while his sibling (who never seems to be very far away) continues his campaign of evil. The final straw is Alice, who loves Frank but loathes Mark. 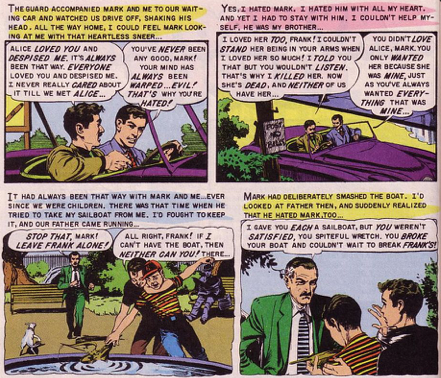 When the lovely lass rejects Mark's loathsome advances, the fiend strangles her right in front of Mark! A jury finds Frank guilty of murder and yet lets him free so Frank knows there's only one thing to do to end his brother's reign of terror and mete out justice for Alice: he cuts his own throat, knowing his Siamese twin brother will die along with him. There's no way you can't see the "shock" of ". . . My Brother's Keeper" coming right from page one. The brothers are never separated (although George does tend to cheat a bit when drawing the men--just where are these guys joined?) and the word "freak" is bandied about. We've encountered Siamese twin stories before and this one is neither better nor worse than the rest. It's just a mediocre script with some nice visuals. While frat-boy Warren Fuller tends to the boys of the fraternity he admires so much, he overhears them grumbling about their teacher, Professor Millstone, and his attitude toward underachieving athletes. Warren proclaims to his fellow students that he can prove Millstone is a commie if they'll accept him as one of their own and then sets to "proving" it by planting red literature in Millstone's dorm room. While this is happening, Warren is contacted by his sister, Selma, who's been keeping her brother afloat while he's in college by sending money. Selma informs Warren that she'll soon be wed and the meal ticket has expired. 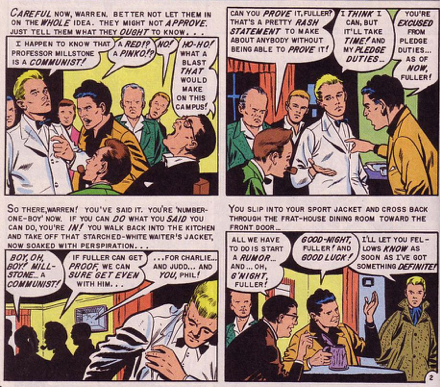 The crafty frat leads his boys to Millstone's room and, in a brazen act of B+E, points out the volumes of Marx and EC Comics sitting by Millstone's bedside. The boys turn the Prof. in to the Dean and all hell breaks loose. While waiting outside the Dean's office to see what fate awaits his victim, Warren is shocked to see his sister arrive but even more nonplussed to hear the news that Selma has married Professor Millstone! His new brother-in-law is fired, his sister disowns him, and the boys of Sigma Delta Dolt declare their frat off limits to the brother-in-law of a commie! Poor Warren is left badly-drawn and all alone. And, oh what bad drawing! 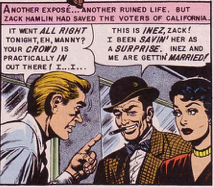 The usually at-least-tolerable Joe Orlando must have been in a mighty hurry as most of his work on "The Hazing" looks like half-finished pencils with a bit of ink thrown on for good measure. Orlando's characters are misshapen freaks (hands and arms are smaller than they should be and one character looks a whole lot like Vincent Price's Egghead); his frat students are middle-aged; and, worse of all, there's not one iota of energy to the visuals (panels are virtually interchangeable). Perhaps the best example is the panel reprinted to your right that shows the absolute ". . . shock, . . . hurt and . . . utter despair etched" on the faces of Selma and Millstone. Oh, and the story's a bloated load of coincidental hooey as well. 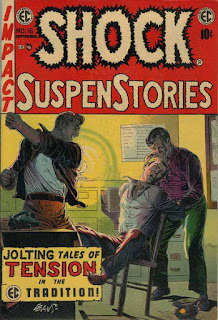 This could be the worst Shock SuspenStory ever (at least I hope it is). More of Joe Orlando's gawdawful work from "The Hazing." Sixteen-year-old Shirley Hansen is taken to a shack at the edge of town and sexually assaulted. Her assailant vows to kill the girl if she reveals his identity to anyone but, when she gets home, her bullying father hauls her down to police headquarters to tell her story. Sheriff Judson and his deputy swear they'll catch the sumbitch and head out to round up suspects. It's not long before they stumble on a young stranger at the local diner, Eddie Nichols, who's just gotten into town and has no alibi for his last few hours. Nichols is naturally angry at being forcibly dragged down to the precinct by the law but, once he sees the growing mob outside, he begs the sheriff to keep him safe. Judson tells him the only way they can protect Eddie is if he signs a confession but it's not until the deputy goes to work on the kid with his fists that Nichols cracks and signs. 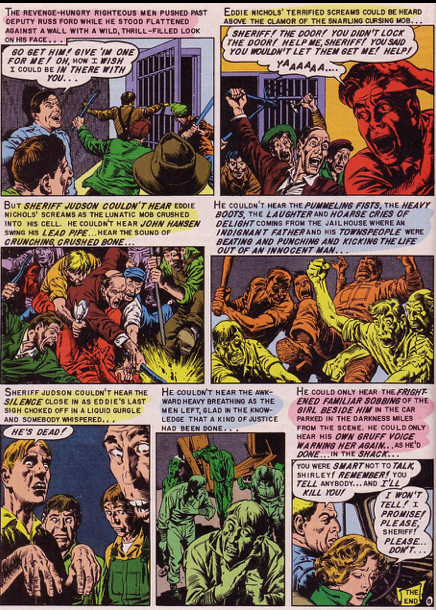 Confession in hand, Sheriff Judson lets the mob outside know they've got their man and then stands aside as the lunatics storm the jail and murder Eddie. 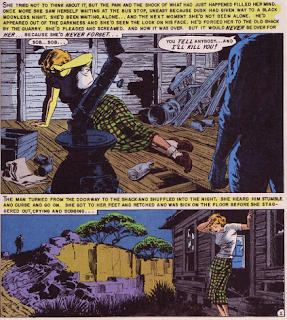 Judson drives Shirley home so that she doesn't have to be witness to the slaughter and warns the girl, again, that if she reveals his identity to anyone, he'll kill her. I first read "A Kind of Justice" back in the early 1980s via Russ Cochran's boxed Shock set and the reveal was a complete surprise to me, so I came at it from a different angle this time, looking for cheats and hints that really are not there. That climax is a Shock. We're inclined to believe, due to past Shocks, that Eddie is innocent but, for me, the guilty finger would naturally point to the aggressive deputy (whose name, Russ Ford, is just too close to that of Lou Ford, the insane deputy of Jim Thompson's The Killer Inside Me, to be coincidence). 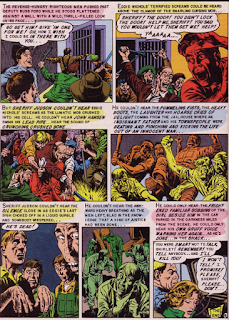 Writer Carl Wessler taps successfully (maybe just this one time, we'll see) into that vein that Al ran dry in the first dozen or so issues, even topping it off with the obligatory crowd exclamation of "He's dead!" Though Reed Crandall's art is exciting and subtly brutal, this is so obviously a story that cries out "Wally!" Yes, the climax is a bit heavy-handed (the aforementioned deputy stands aside, almost salivating, as the crowd rips Eddie to pieces) but "A Kind of Justice" still packs a wallop. A typical yawn-inducing Kamen panel. 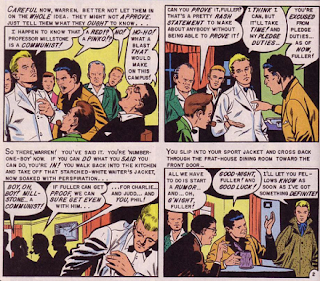 Jack: I read this issue before I read your comments, Peter, and I was shocked--shocked, I tell you!--that they were so negative. Though I figured out what was going on early in " . . . My Brother's Keeper," I thought Evans did a great job of keeping it hidden and the script is decent, especially for Wessler. "The Hazing" is heavy-handed and of its time but Orlando's art is less bizarre and ugly than it has been lately, so the story is bearable. Crandall's superb art makes "A Kind of Justice" a powerful tale, though I thought the end was telegraphed way before the last page. The Kamen story is not terrible, though Jack's art makes everything look like it's transpiring in 1954 and there's no sense of time passing. His attempt to draw a rumble is laughable. All in all, this is the best of the three comics we read this week and a reasonably good issue of Shock. Live Up to the Old One? And coming on February 18th: The Classic TV Villain Blogathon! Gee, my opinions usually line up with Jack's when Jack and Peter disagree about Shock, but this month I see it Peter's way: I think Crandall's "A Kind of Justice" and the electric cover that Evans does based on the same story are terrific -- the high points of the final four issues of the book. But I think all three of the other stories are really subpar; Wood's absence starts to drain the life out of the book right here. 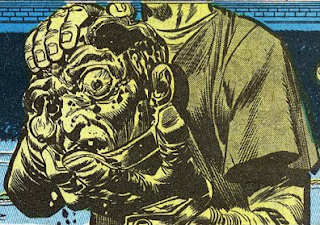 Maybe I was just in a good mood when I read that issue of Shock. It's funny how your mood can affect your opinion sometimes. Seing how by the numbers those last stories are one wonders how EC would have fared if it hadn't been railroaded by circumstances. The Wessler stories sound really dull. On the other hand those Krigstein drawn stories sound like that they were miles above the rest. Why exactly did Wood stop working for EC? I forgot, did you review "Aces High"? I'm not sure that Wally's work could have salvaged anything from the train wreck known as "The Hazing." Not saying it wouldn't have been nicer to look at but I do tend to grade a story more for the script than art (most of the time, that is) and "The Hazing" was nothing more than a box-checker (let's see, we dealt with hatred towards blacks, jews, blind people, women...). Rumor has it that vegetarians were next on the list. Aces High was one of the New Direction titles and we're scheduled to review #1 in Issue 60 (June 25th). Incidentally, if I failed to mention, due to the new titles added and our monstrous workload, we've divided the months in two, covering three or four titles a post. Peter: Fair enough. “The Hazing” isn’t much of a story, and it couldn’t have been the best thing in this issue even with spectacular Wood art, because “A Kind of Justice” is an infinitely better story. Art counts a lot, though; I think “The Confidant” in SS #15 is a time card puncher of a story, but Wood’s art makes it better than it deserves to be. I also think “. . . So Shall Ye Reap” from SS #10 is a hugely praised standout only because Wood drew it; I don’t think the story itself is as good as the stories in “A Kind of Justice” or in Wood’s contributions to SS ## 7 - 9, but EC fans single it out a lot, and I think that’s because of the haunting illustration. And I definitely believe that the choice of Orlando — instead of Wood or Krigstein — for “The Monkey” is what keeps SS#12 from being the high water mark of the title. I’m really looking forward to see what you guys have to say about Aces High and Piracy. 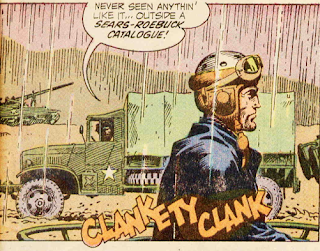 For some reason, I never read those two titles when I was a kid, even though I loved (and ultimately collected a complete Gaines File Copy run of) Valor, and even though those two titles are the sort of thing I’ve always liked. I think I’ll pick up copies of Piracy and Aces High online of off of Amazon and read along with the two of you when you get to them. Peter&Jim, thanks for the infos. I stumbled upon Aces High when I read up about George Evans, whose covers I find marvelous. Thinking how different you rated air combat stories in the DC war books - in this case I think the art is more important then the story; if you can't draw a plane convincingly, it doesn't matter how good the script is - I am very interested on your opinion. 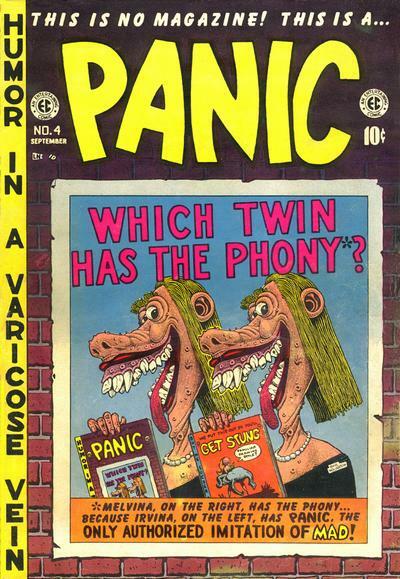 I never even knew Aces High existed, and seeing those few covers on the CBDB one wonders how much work Evans poured into these comics which were viewed as disposable. The comic being parodied is SMITTY. Not well-remembered today, but I wouldn't have thought it was all THAT obscure to a couple of old EC/comic/popculture mavens like you guys. It ran for fifty years, and once won a Reuben. . .
Back in the '70s, when I was reading widely about the history of comics, I read a lot of newspaper strips, but this one still doesn't ring any bells, even after looking at it online.